This post is dedicated to #HHG11 and @ainie.kashif. This is my first one in the group of HHG. I write about the nouka baich (boat race) which is the folk culture of Bangladesh. The boat is ready for race. Bangladesh is riverine country. From childhood every people of Bangladesh has a deep relation with river. So the river has become such a lively sports companion. In this context, the boat is not only a means of communication but also it is becoming an important part of the water as a good vehicle. Boat race is one of those spectacular thrill examples. 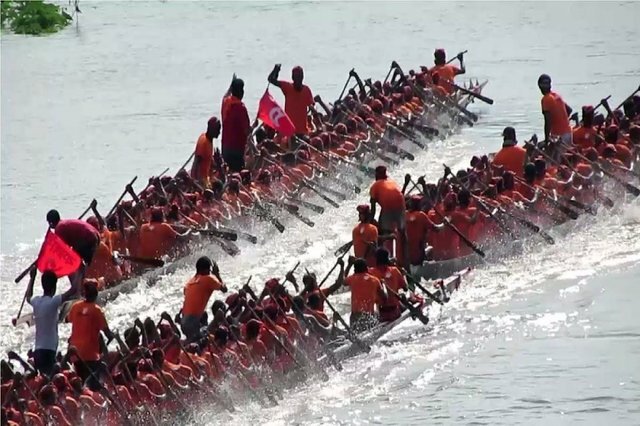 Boat race is a thousand years of heritage and culture of Bangladesh. Is not available in the memory or history. From the time of the tradition, the boat race was one of Bengal's heritages. Among the ancient historic sports of Bangladesh, nouka Baich is one of the most important sports. Various types of boats are used in different areas of the country for the nouka baich. 'Mesopotamian' people was first introduced it in the world, as history has said. About 2000 years ago, people of Mesopotamia organized a boat race in the Euphrates River. After a few centuries, boat competition began in Egypt's Nile River. After that spreading it in all over the world. This is still very popular in the Oxford and Cambridge University. Since 1900, there is boat race in the Olympic competition. A new made boat in our village. For the boat race, boat is slender and tall. Because, the boat are able to cut the water of the river fast. It helps to win a race. About 150 to 200 feet in length or be more. But its width is a little more than 3 to 4 feet. 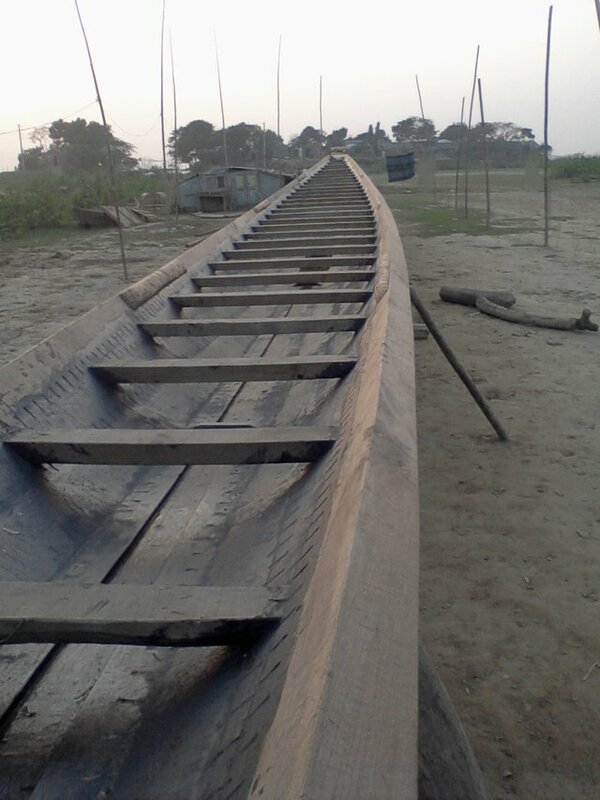 To build the boat, shawl, shil karai, chambul and garjon wood is used. During the boat race, singers are singing songs together in the boat. This called shari gaan. In the boat, There are drum and tabla for singing. Their songs give the encouragement and power of the boatmen. It has a starting point and a ending point. All of boat start at a time, which one is reached at the ending point first this boat is winner. In the current time this is so popular in all of the ages people in Bangladesh. A huge audience on the bridge. ##The interested thing is that, We have two boat in our village for nouka baich. Do you ever participate in nouka baich ? Yes i was participate in nouka baich. its feeling great. Thanks, Nouka baich is my dream.....yours? Not dream. its already done. This post has received a 0.05 % upvote from @drotto thanks to: @shariif. Since I was born in a village located beside the bank of Padma, I am so familiar with our strong tradition Nouka Baich. But now-a-days it is fighting with its existence. Govt. and social activist should come forward to survive this heritage. Feel delighted to see your passion on Nouka Baich. We will await for your more post on Bangladeshi heritage !!! Now the various non governmental organization have come forward to organize this. and i occurred in current days. Hi @sharif, I have watched boat race show so many times on tv and I enjoyed watching it all the time. I’m amazed to know that the boat race is so famous now. The shape of boat looks stunning and made in very technical way. It’s good to know about my neighbouring country’s reach tradition Nuaka race. Stay blessed @sharif. Hello @ainie.kashif I am so grateful. Thank you for your good commendation and wishes. Hi @shariif! You have received 0.1 SBD tip from @ainie.kashif! Earn daily income on steem: @tipU distributes 100% profit + 60% curation rewards to all investors. @sharif, this boat race looks very fast and very exciting! I see you have done the race, was it for your country or you home team? Wow! there are so many people on the boat. how many people do you have on the boat? Hello @rlt47, Sorry for answer you late. Yes this is go so fast. Because this is a team work. and every team member give the best effort to win. I was in our village local team for boat race. In traditional boat, most of the time team member is 100 or up. If the boat is little then People can be much lower. Now worries, wow that is a lot of people!